Campbell Scientific solar-farm weather-monitoring systems report back to the site SCADA system, where the data is integrated into a data historian for short/long-term performance, as well as the values being reported to the IESO. With climate change and pollution becoming important issues globally, it is important for governments and industry to continually respond to changes in technology and the environment. The government of Ontario has made a commitment to renewable energy and has therefore created the Feed in Tariff (FIT) program under the Green Energy and Green Economy Act (2009) to encourage the development of renewable technology and its implementation in Ontario. The FIT program is North America’s first comprehensive, guaranteed pricing structure for renewable-energy production, and it standardizes many aspects of renewable-energy installations. The government target for renewable energy is 10,700 MW by 2018 (which includes energy from solar, wind, and biomass, but excludes hydroelectric power) and they are well underway to achieving their target. One of the major issues with renewable energy is the variability in power generation it provides. As we all know, the wind does not always blow and the sun does not always shine. This can be problematic for electrical grid operators, as it is difficult to predict the weather variance that may occur throughout the course of a day. This variance greatly affects the energy output of installations and, therefore, the supply of power to its customers. To gain information about current weather conditions at these types of installations, the Independent Electricity System Operator (IESO) requires that all wind and solar installations above a certain size must have weather stations with specific parameters being measured. In the case of solar energy, this applies to any installations larger than 5 MW in size. 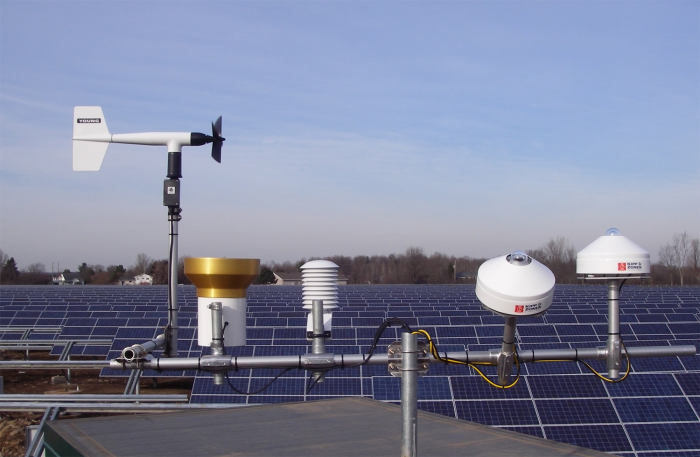 Each solar farm must have a minimum of two weather stations, and each station must measure global horizontal and plane of array irradiance, air temperature, wind speed, wind direction, barometric pressure, and back-of-module temperature. The sensors are mounted within the solar field to provide weather information that is as accurate and as close to the power generation itself as possible. Each site must report the current weather conditions to the IESO every 30 seconds for the life of the project. A secondary purpose of the stations is to provide site performance data to the owner to ensure their site is performing as expected during the life of the project. The CR1000 datalogger is currently being used in numerous large-scale solar projects to support these requirements. The CMP11 pyranometer and CVF3 ventilator from Kipp & Zonen have quickly become the standard radiation sensors on many of the solar weather stations in this application because of their superior accuracy. The datalogger communicates directly with the site supervisory control and data acquisition (SCADA) system and provides real-time measurements. In some applications, historical information is available. The CR1000 typically communicates to the SCADA via Modbus protocol via the NL120 Ethernet module. The SCADA operator is able to see the real-time and historical values in their human-machine interface (HMI) to examine current and past weather and to detect any faults present in the weather-station system. As the renewable energy sector grows in Ontario and across the country, so does the importance of monitoring current weather, which benefits all users of the electrical grid.